Registered Nurse Robbie Thomas takes Whitney Austin from her room in ICU to a recovery room at University Medical Center. Whitney Austin, a Louisville native, recounts the moments leading up to a mass shooting at a Cincinnati bank that left four dead, including the gunman, and two others injured. 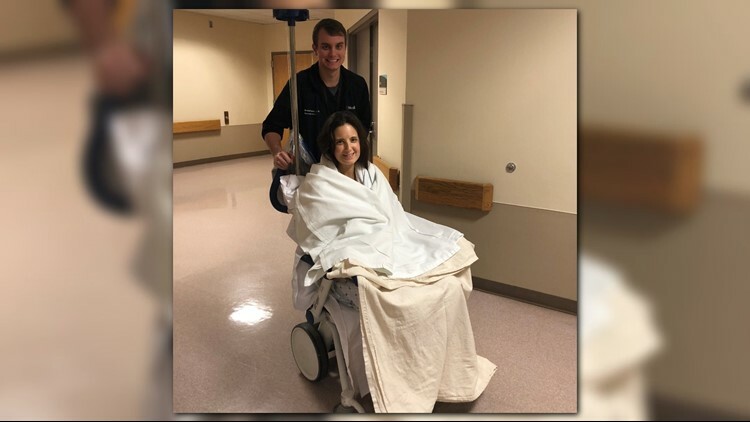 LOUISVILLE, Ky. (WHAS11) – Just days after a deadly shooting that claimed the lives of four people and wounded two others, one of the victims is sharing her story as she recovers in a Cincinnati hospital. Whitney Austin, a Louisville native, recounts the moments leading up to her being shot 12 times during as she headed to work. Austin said she attended a late skating party with her two kids and friends from school on Wednesday. Set out for her regular Thursday routine, Austin headed up to Cincinnati for a day of meetings at Fifth Third Bank’s headquarters. She’s been with the company 15 years. Austin had joined a conference call while she was en route to the office, pulling into the garage around 9:02 a.m. and began walking while talking with several colleagues on the phone. She said she had the phone to her ear along with carrying her clutch purse, notebook and laptop bag – Austin said she glanced at her reflection in the glass of the revolving doors that led to the lobby. Moments later she said she was hit by a hail of gunfire and collapsed while being contorted within the threshold of the doorframe which made it difficult for her to breathe. She said tried reaching for her phone when she was shot again by the suspect. “All I could think of was, ‘why did I move? Just play dead. Ok. I am going to hold very still,’ Austin said. Austin said she played possum, but her mind began to race. “How did I get selected to be a victim of a mass shooting?’ I was confused and angry. This is such a ridiculous situation – it’s unreal,” she said. She said while she laid on the floor she thought about how she felt about controlling access to guns and eliminating gun violence. The emotions Austin said she felt ranged from the “shock of being shot” to realizing she would be okay. However, in those moments she said she began to make her peace with God. Austin said she never saw the shooting but said when she saw police officers, it gave her hope. As she was taken to safety, Austin begged for emergency responders to save her. They began working on Austin, identifying wounds to her body. She said they kept telling her to hang on. “Then I realized I was breathing, and thinking and that I was going to live,” she said. Austin said around 9:19 a.m., police contacted her husband letting him know that she had been shot several times during a mass shooting at her workplace. Waller said when he heard his wife’s voice, he knew she might be okay. Officials with Fifth Third Bank say Austin has since been moved out of ICU and is still recovering at the University of Cincinnati Medical Center. She has been able to contact her kids and they are doing okay. Austin said she is not thinking about the day but is looking forward to what the future holds. Police say the shooter, 29-year-old Omar Enrique Santa Perez had never worked in the building and didn't have any ties to the victims. He was allegedly armed with a 9-millimeter pistol, multiple magazines and about 200 rounds of ammo. He was fatally shot by police.